Health insurance. We all know it can be expensive but for the more budget conscious among us it can be considered downright wasteful. Why pay money for hospital cover that you may never make a claim on? And what about those extras that you can never find time to make use of? ahm, a health insurance provider owned by Medibank, aims to change this. Previously a small niche player, ahm has been rebranded – its sights refocused on the lower cost end of the market with a unique customer proposition developed by our team. Starting with the insight that many consumers do not see the value in the ‘value’ end of the market, we sought to redefine ahm as a brand of choice for those who believe low cost policies are “not worth the paper they’re written on”. A brand for people who believe that value is about getting more for less, and minimising waste. At the heart of our strategy was the idea, ‘All the things you need, and nothing that you don’t’. A complete (and yet, frugal) redesign of the brand identity was subsequently undertaken by our designers. The result is a new look and feel that ensures ahm clearly stands out from the pack. The brand looks bold and single minded, but also pared back and efficient. Every element has a purpose – there is nothing superfluous and no wasted effort. 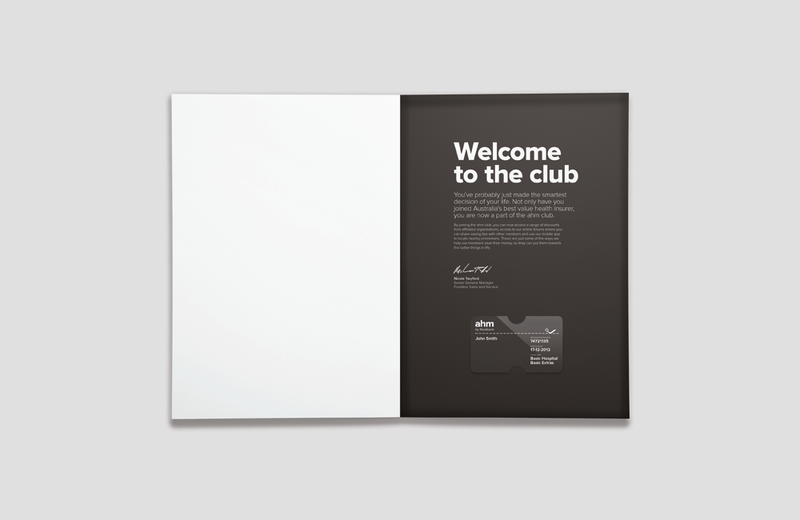 So, from a colour palette of black and white that saves on printing costs to a perforation line device that helps highlight and house important information, the new look and feel is the perfect expression of ahm’s new brand idea. The logo is now framed within a coupon device, with a Medibank endorsement line that provides additional credibility for the brand in its new low cost battleground. The way the brand speaks has also been sharply defined, with a tone of voice that is courageous and upbeat, and always up-front. ahm enjoyed the our brand video so much, they then commissioned interbrand to create and animate their first TVC (above). Below, ahm's quarterly member magazines take on different subject each time, demonstrating new ways to save on other things in life. The members pack (above) was purposefully luxurious to give members a rich moment in an otherwise economical experience.